We don't have much information other than GN board member Sung-Hee Choi has been taken to a Jeju Island hospital because of deep concern for her health. 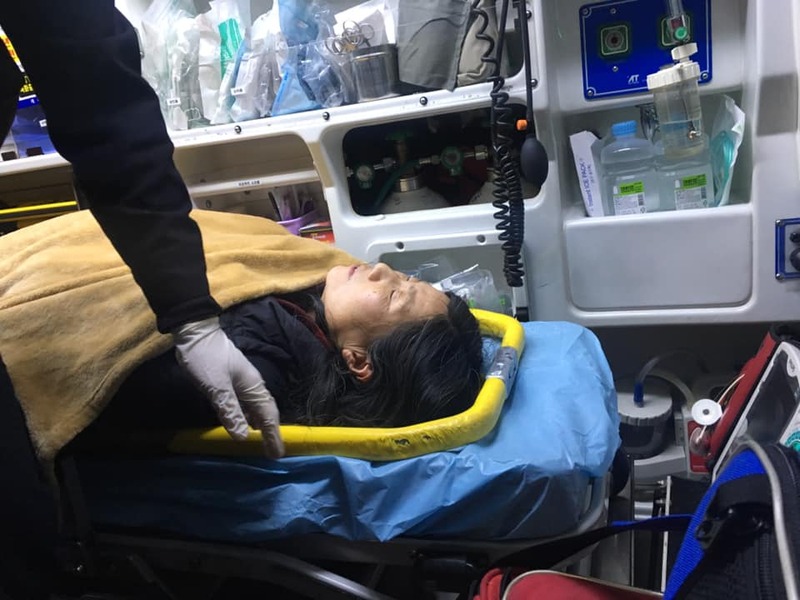 She and several others have been holding extended hunger strikes on Jeju Island, South Korea to oppose a 2nd airport on the island that many believe is going to have military application. Sung-Hee has long been a leader in the fight in Gangjeong village against the Navy base that was built for the US so it could port its warships being sent to the Asia-Pacific under the 'pivot' of Pentagon forces into that region by the Obama administration - and now continues under Trump. I believe all of these four in this photo have been doing the hunger strike and already at least three of them have been taken to the hospital. Our hearts and prayers are with all of them. We must all keep up the fight against the preparation for WW III now underway by the US, NATO and its various allies which is without any doubt aimed at China, Russia, North Korea, Iran, Syria, Venezuela and more. Any nation that does not surrender to the western corporate capitalist banking system is having a loaded gun pointed at their heads and are told - 'every option is on the table'. 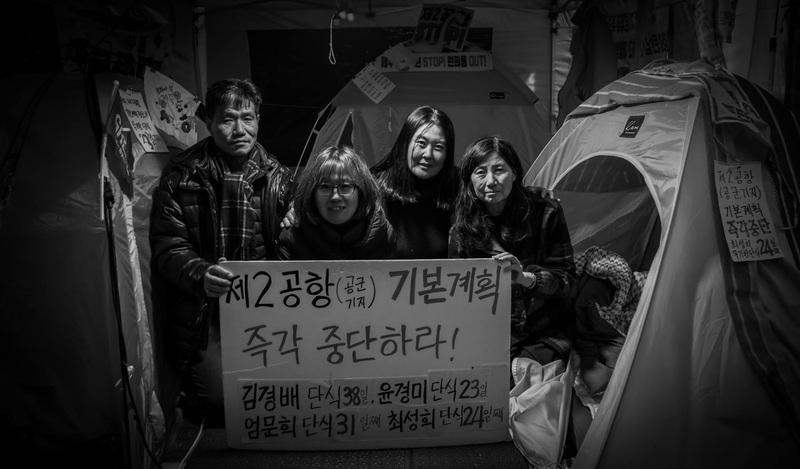 Update: We have received word this morning that Sung-Hee is doing alright and has ended her 24-day hunger strike. NBC News and their Capitol Hill correspondent Kasie Hunt claimed that Democratic presidential candidate Tulsi Gabbard was being supported by a “Russian machine” (RT). RT’s Dan Cohen, the reporter behind the Gabbard story that has since been attacked by Hunt, sits down with Manila Chan to discuss the credibility of NBC. Investigative journalist Ben Swann joins the discussion about the attacks waged against RT, the state of journalism in America and Tulsi Gabbard’s foreign policy reputation. Art work by Will Park - my friend and 35-year collaborator on using art to illustrate the organizing of the Florida Coalition for Peace & Justice as well as the Global Network Against Weapons & Nuclear Power in Space. We traveled to Cuba together and had regular BBQ lunches throughout the greater Orlando, Florida area for many years. He illustrated our newspapers, our flyers and our posters. He even made a short film about our work called The Poster. Will is one of the greatest artists and humanists that I've ever known. 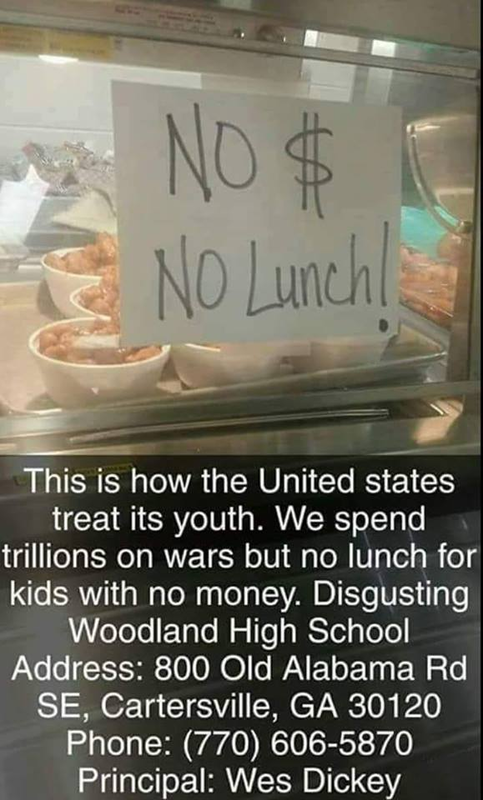 This sign at the school lunch room reminds me of the story about Sitting Bull, the Hunkpapa Lakota leader who led his people during years of resistance to US Army efforts to exterminate the native population. He was killed by Indian agency police on the Standing Rock Indian Reservation during an attempt to arrest him, at a time when authorities feared that he would join the Ghost Dance movement that some believed would revive the Lakota nation. Prior to his death Sitting Bull was a performer with Buffalo Bill's Wild West show that toured east coast cities in the US. He earned about $50 a week for riding once around the arena, where he was a popular attraction. 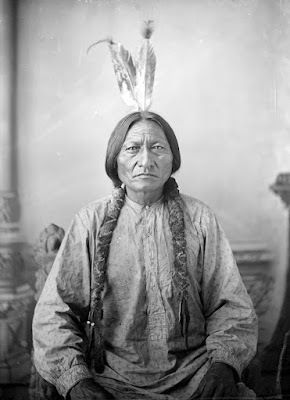 Sitting Bull stayed with the show for four months before returning home. While in New York City one day Sitting Bull was walking down the street and many homeless children came up to him begging for money. He sat on a door stoop and handed them coins and spoke with them. When Sitting Bull returned to the South Dakota reservation he spoke to those gathered around a council fire. He told them, "We are in big trouble. You should see how the white man treats his children." I interviewed Tanya Bukharina yesterday on my public access TV show that has been playing on local stations across Maine for the past 16 years. I asked Tanya if Putin and Russia want to recreate the former Soviet Union and take over the world as the US and NATO have repeated claimed. She of course laughed at the suggestion and reminded me that when she took me around Crimea last October during my trip to Russia there were construction projects all over the place. Her point - Russia is investing in building not destroying. If you, like me, are fact oriented then please consider the simple truth that Washington spends about one trillion dollars a year on its war machine in comparison to Moscow which spends about $60 billion a year on their military. In fact Russia has cut their military budget the last two years in order to help deal with poverty across their nation. 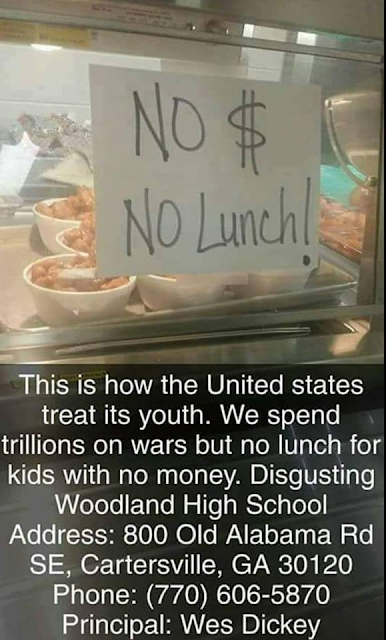 Don't we wish we had a government in the US that would do the same? Tonight here in Brunswick we are holding a pot luck supper for Tanya (although a big snow storm is to begin about the same time as the supper). On Sunday, Feb 17, she has a public speaking event at the local library in Brunswick. 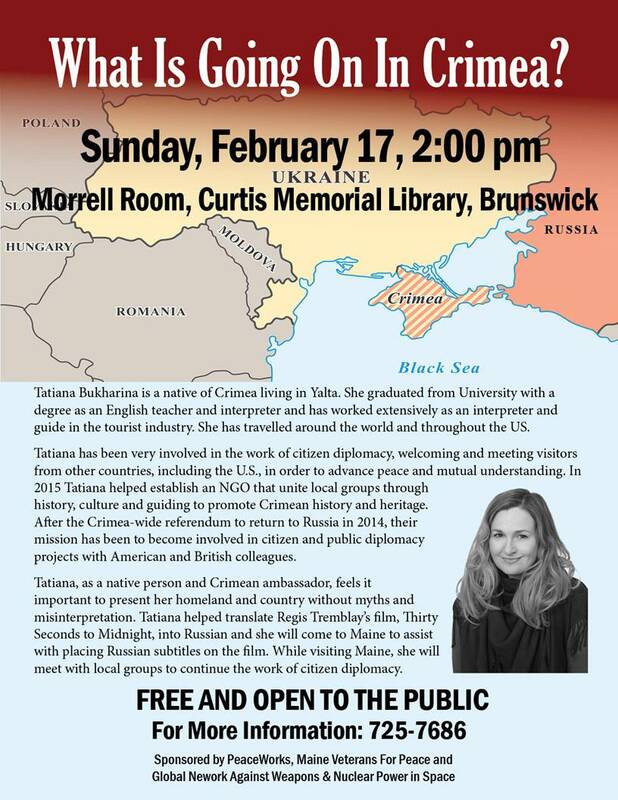 I know of some people driving all the way from Boston (3 hours away) to hear Tanya speak. Should be great. We don't often get the chance to have speakers from Russia visit us but I can't think of a more important time than now to do just that. The lies, demonization of Putin and Russia, and the escalation of US-NATO encirclement of Russia is worse than even during the Cold War days. While I don't trust the mainstream corporate controlled media I still keep an eye on it. (The great 60's activist Abbie Hoffman once spoke at a Florida Coalition for Peace & Justice retreat I organized in the late 1980's and he asked us, "If you don't watch TV how the hell can you know what the American people are thinking?") I've never before seen the kind of non-stop recycled red-baiting that is going on these days. When I take a group of Global Network and Veterans For Peace members to Russia in the spring for a study tour we will also visit Crimea and Tanya will be our guide. Americans have been taught to viscerally hate and fear everything Russia. We thank Tanya for coming to help humanize the good people of her country. An intense political conflict has flared up, this time between France and Germany. It seems that nobody saw it coming. Since as recently as January, in Aachen, Germany, Emmanuel Macron and Angela Merkel were looking like new lovers. However, this political honeymoon didn't last for long. No more than two weeks later, the German Süddeutsche Zeitung announced Macron's anger. On Thursday, the newspaper published a leak that France was planning to confront Nord Stream 2 - the natural gas pipeline from Russia to Europe. The US wants to kill Nord Stream 2 and force Europe to purchase more expensive 'fracked gas' shipped overseas by American energy corporations. It appears that Macron has taken Trump's side on this one. Maybe Trump has promised Macron that Washington will protect Paris from the Yellow Jackets? 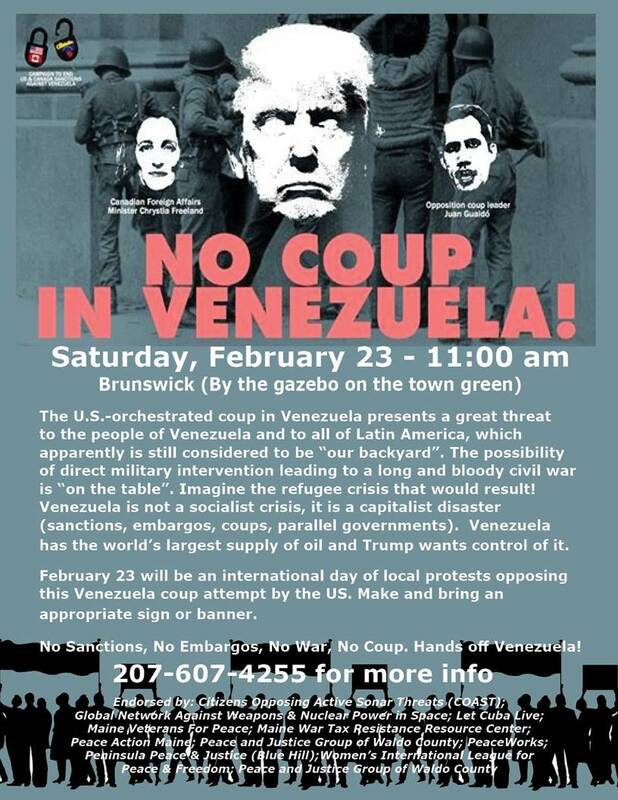 Vijay Prashad discusses the extent to which US interest in Venezuelan oil and other natural resources is driving Trump’s policy of seeking regime change. Prashad is the executive director of Tricontinental: Institute for Social Research. He is the author or editor of several books, including The Darker Nations: A Biography of the Short-Lived Third World and The Poorer Nations: A Possible History of the Global South. His most recent book is Red Star Over the Third World. He writes regularly for Frontline, The Hindu, Alternet and BirGun. 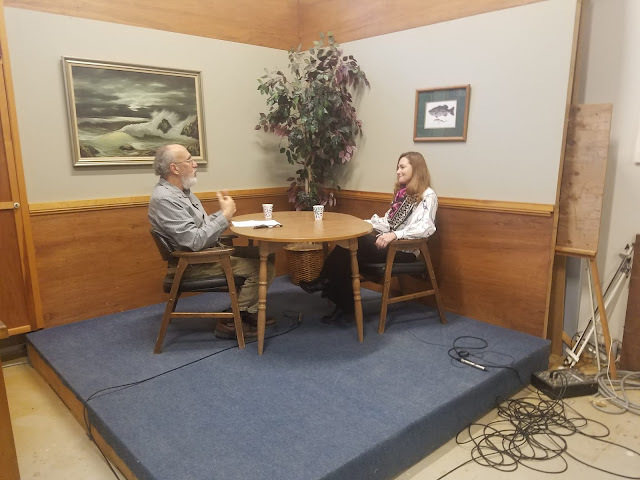 I'll also be interviewing Tatiana (Tanya) on my public access TV show that airs on 17 Maine stations. We do the show on Monday and should have it up on YouTube in a week or so. Tanya was my guide in Crimea when I visited there last October and will be guiding our study tour group when we go there next spring. She really knows her stuff when it comes to history and culture of Crimea. Going to be a great talk on February 17.